In Japan, as late as the mid-nineteenth century, smallpox claimed the lives of an estimated twenty percent of all children born-most of them before the age of five. 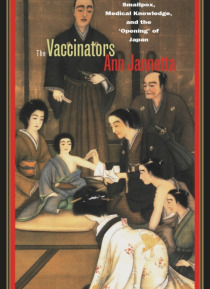 When the apathetic Tokugawa shogunate failed to respond, Japanese physicians, learned in Western medicine and medical technology, became the primary disseminators of Jennerian vaccination-a new medical technology to prevent smallpox. T… racing its origins from rural England, Jannetta investigates the transmission of Jennerian vaccination to and throughout pre-Meiji Japan. Relying on Dutch, Japanese, Russian, and English sources, the book treats Japanese physicians as leading agents of social and institutional change, showing how they used traditional strategies involving scholarship, marriage, and adoption to forge new local, national, and international networks in the first half of the nineteenth century. The Vaccinators details the appalling cost of Japan's almost 300-year isolation and examines in depth a nation on the cusp of political and social upheaval.